Hi Friends: There is a new challenge today over at the Crafting When We Can Challenges Blog, where the current theme is Use an Animal as your focal point. I hope that you are inspired by my creation and will join us over at the CWWC blog to see the creations of the other design team members and enter for your chance to win a great prize from our Design Team! 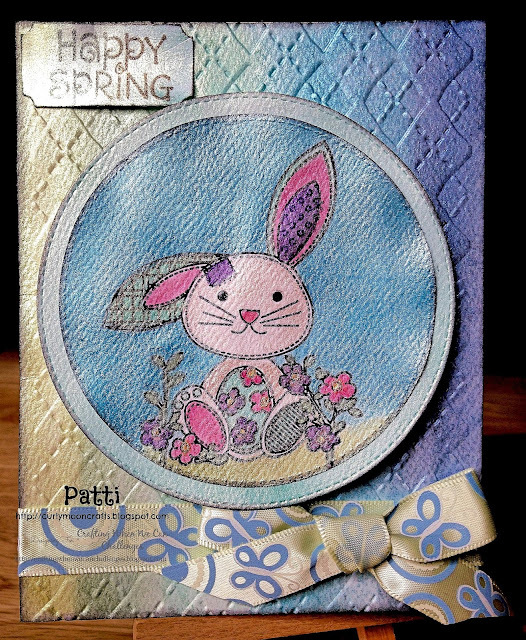 Stamp bunny image onto watercolor paper with Archival ink and color with pearlescent watercolors. Die cut the image using the stitched circle die. Cut next larger sized circle from watercolor paper and color with watercolors, then frame the focal image with it. Add Glossy Accents to the bunny's eyes and nose. Cut an A2 sized piece of watercolor paper, emboss with embossing folder, then ombre paint the background with the green and blue watercolors. Ombre color another small piece of watercolor paper for the sentiment, stamp sentiment with Archival ink, then cut with ticket punch. Ink all edges with Black Soot ink. Assemble the card, placing the focal image in the center with foam squares for dimension. Finish with coordinating ribbon and bow. Looking at your card, I am amazed at the amount of shimmer from the watercolors you used. The image you have is also really really cute! Thanks for sharing and thank you for your visit to my blog and sweet comment on my card Patti!